is a DWDM DFB laser transmitter for return path (upstream) fibre optic links in CATV networks. HDO371 transmitter is available at different ITU wavelengths to support DWDM applications. The transmitter can be installed into HDX installation frame. is a dual receiver module for fibre optic return path (upstream) links in CATV networks. It is installed into HDX installation frame. 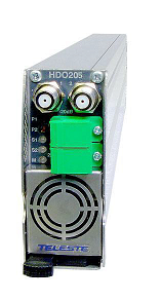 HDO203 has an integrated alarm receiver to enable a monitoring data of AC800 FTTLA node or CXE880 node.